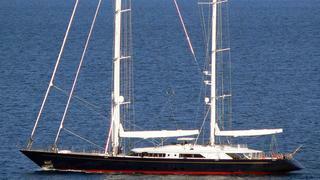 The 55.7 metre sailing superyacht Burrasca, listed for sale by Arcon Yachts, has had a €1,000,000 price reduction. Burrasca was designed by Ron Holland with Italian yard Perini Navi and built in aluminium to ABS class with delivery in 2003. Accommodation is for up to 12 guests in a master suite, two double and two twin cabins plus two Pullman berths. All cabins have en suite bathroom facilities. Among many luxurious amenities for guests, there is a fully equipped gym, sauna and steam room. The first of Perini Navi’s 56 metre series of yachts, Burrasca's proven sailing performance and handling, luxurious yet flexible accommodation and solidly reliable engineering and systems platform blazed the trail for nine (and counting) other individually customised versions. An aluminium hull rather than the yard’s former choice of steel combined with a slippery hull line optimised by Ron Holland, and a deep, ballasted centreboard gives her much improved sailing performance over her Perini predecessors. This yacht for sale began a world cruise immediately upon leaving Perini Navi’s Viareggio yard in 2003. She was refitted in 2007 and in 2014 her rigs were removed and repainted while she completed her 10 year ABS survey. Under her current ownership she has continued to receive continual upgrades throughout 2015 and 2016. Under power, twin 1,256hp Deutz engines give Burrasca a range of 3,750 nautical miles and she has never been chartered. Lying in Valencia, Spain, Burrasca is now down to €15.5 million.